Product prices and availability are accurate as of 2019-04-25 06:20:55 BST and are subject to change. Any price and availability information displayed on http://www.amazon.co.uk/ at the time of purchase will apply to the purchase of this product. 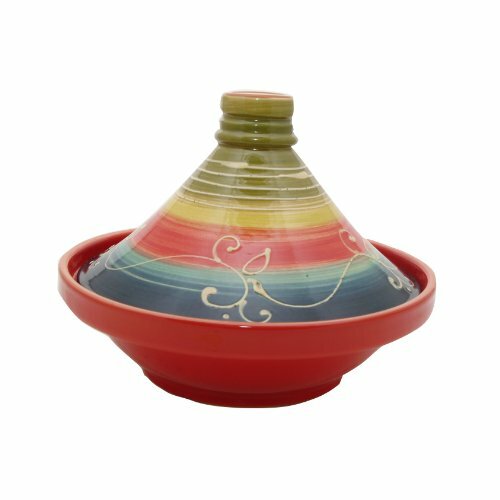 Mason Cash 28cm Striped Tagine is inspired by the cuisine of North Africa, the Mason Cash tagine consist of two parts; a base unit which is flat and cirular with low sides, and a large cone shaped cover that rests inside the base during cooking. The Mason Cash range of tagines has been inspired by the cuisine and culture of North Africa. Each of the new tagines is decorated with vibrant colours and patterns synonymous with the region. Made from chip-resistant terracotta, they are light and easy to use, resulting in tasty, succulent dishes every time.